THURSDAY 11 January at noon. ……….Chorale Prelude on ‘why does the azure deck the sky’? THURSDAY 11 January at 8:00 p.m.
FRIDAY 12 January at 8:00 p.m.
played by the participants in the Festival with Dr. Barry Rose conducting. Participants and the Adult Choir of Grace Church forming the Festival Choir. SATURDAY 13 January at 3:30 p.m.
One of the UK’s most distinguished and experienced choirtrainers, BARRY ROSE has spent a lifetime in choral music, directing the choirs at no less than three English Cathedrals – Guildford, St.Paul’s, and St.Albans – as well as spending 20 years on the staff of the BBC, as their Music Adviser to Religious Broadcasting. 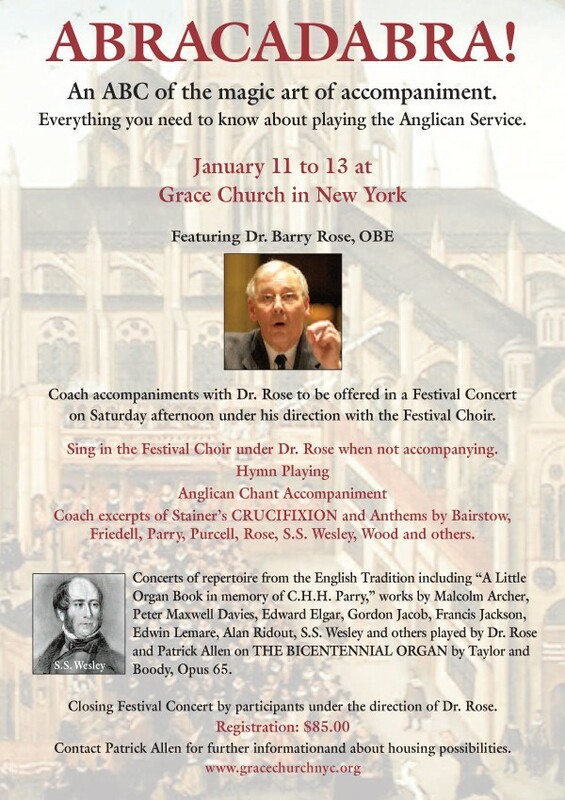 Dr.Rose has been a regular visitor to this country since the early 1970’s, when he directed one of the first choirmasters’ Conference to be held at St.Thomas Church Fifth Avenue, and has led many choral workshops, courses and services including those of the Royal School of Church Music in America and here at Grace Church in New York. During his ten years at St.Albans, the Cathedral choir visited the USA no less than 5 times, and on their last visit (before he ‘retired’ in 1997) they sang a memorable concert here in Grace Church, with guest organist Peter Richard Conte. In the past seventeen years, at Dr.Allen’s invitation, Dr.Rose has renewed his contact with Grace Church with this month marking the tenth occasion he has conducted the combined novice and junior boy and girl choristers in the Annual Concert of Music for Treble Voices and the “Whiting” of Novices. 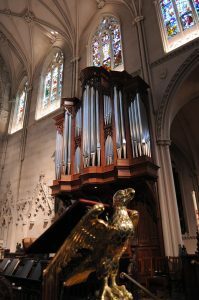 He recently completed a set of Sacred Songs “Songs for Grace” specially written for them and premiered at that Annual Concert Festival. He was also honoured to be invited as guest conductor of the Combined Choirs of Grace Church in New York at the Opening Concert (Inauguration) of the Bicentennial Organ in April 2013.